This monument is one of several Veterans Monuments near the intersection of Baltimore and Arnold Avenues in Point Pleasant, NJ. 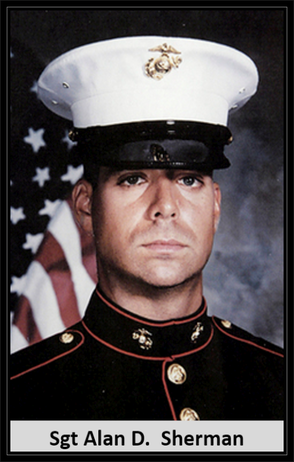 Died: June 29, 2004 in Operation Iraqi Freedom. Unit: Marine Reserves, 6th Engineer Support Battalion, 4th Force Service Support Group, Marine Corps Reserve, Folsom, PA. He was killed in eastern Iraq by a roadside bomb. "Died in the service of his country - Loving father, son, brother." A 36-year-old reservist from Ocean Township was among three Marines killed in Iraq when a roadside bomb ripped through their military convoy on Tuesday, authorities said yesterday. Sgt. 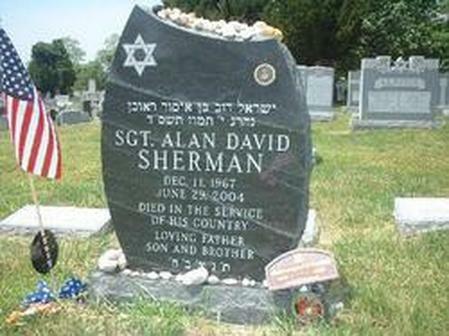 Alan Sherman and the two other reservists - Cpl. John Todd III, 25, of Bridgeport, Pa., and Lance Cpl. Patrick Adle, 21, of Belair, Md. - were the first Americans killed in combat since the transfer of sovereignty on Monday. Another New Jerseyan, Marine Cpl. Mateusz Erszkowicz, 26, of Passaic, was injured in the same attack and dragged bodies from the vehicle before medics arrived, his sister said last night. Erszkowicz's injuries were not considered life-threatening. Sherman's ex-wife, Dolores, spoke with reporters last night in front of the split-level home in Ocean Township's Wanamassa section where he grew up and still lived with his parents, Austin and Sarah. Marines arrived at the home Tuesday night to inform the parents of his death, and they were still too distraught to talk. The Shermans married in 1993 - they met a year earlier at a 7-Eleven in Point Pleasant where she was working part-time - and divorced six years ago. Dolores Sherman lives in Brick with the couple's two sons, Joshua, 10, and Logan, 7. She said she and the two boys were at the Ocean Township house when the Marines arrived. "They know," she said, referring to her sons. "They were here when the Marines came . . . and they knew as soon as the Marines walked in." She said her ex-husband, who graduated from Ocean Township High School, was a doting father and dedicated soldier who fulfilled a childhood dream when he joined the Marines in 1994. "He was soldier, through and through," she said. "He was a great dad, a good son. He was totally devoted to his children, to his family. He just liked spending time with his boys. They were his world." Sherman had done a tour of duty in Kuwait last year and was called to Iraq in February, his ex-wife said. When not on duty, Sherman worked as a licensed practical nurse, she said. He did not want to leave his children and go to war, but he never questioned his orders, Dolores Sherman said. He never expressed any personal feelings about the politics of the conflict, she said. "It was very, very hard for him to leave. He was told to go," she said. "This is what he wanted to do. He was a Marine. He wanted to serve his country, and he left. He knew he was doing the right thing. He wanted to fight for his boys so they wouldn't have to do it. He totally believed in what he was doing." Dolores Sherman said she and her former husband maintained a good relationship. She said she last spoke to him two weeks ago and had received an e-mail from him on Sunday. Sherman and the others died when a roadside bomb exploded near the lead vehicle of their convoy, which was traveling along a four-lane highway in the Rustamiya district of Baghdad. The reservists were members of the Bridge Company B of the 6th Engineer Support Battalion, based in Folsom, Pa.
Dolores Sherman said her ex-husband provided security for the unit. Sherman was the 28th soldier with ties to New Jersey to be killed in Iraq since the U.S. invasion began 15 months ago. Nydia Pola, who lives two houses away from the Shermans on Thomas Avenue in Wanamassa and had known Sherman since he was a child, said he lived for his children. "The first thing you always noticed about Alan was that he was a wonderful dad," she said. "His kids were the spitting image of him."